Relieve Weekday Tension with Micro Movements – by Tone Cardenas P.T. If you have back pain and/or headaches and you sit a lot throughout the day, you should remember: prolonged sitting is very taxing on the spine. The tired and poorly-postured spine will affect your energy levels, your alertness, physical tightness (headaches included) and your overall sense of well-being. The body is designed for frequent MOVEMENT. If it doesn’t get sufficient movement or stretching, the muscles and joints will stiffen up very quickly. This results in decreased circulation of blood, lymph & energy, and if your livelihood revolves around a desk, decreased productivity. While at your desk, stand up as frequently as you can and take the opportunity to move a little or stretch a little. You can also do any of the above while driving your car, to help keep you fresh on long commute drives and to keep your buttocks from falling asleep. Cinch your seat belt tight and play with range of motion movement against the seatbelt making circles, squares, triangles, numbers, or the ‘pelvic alphabet’ with the hips. The seatbelt functions as a sort of resistance band and will activate each movement from within the core, where your spine sits. Singing is also an excellent exercise to keep your body active while driving. Actively singing will expand/contract the diaphragm, which in turn massages the spine and keeps blood flowing to the brain. Standing up on your toes and tightening the calves, glutes, thighs all at once or in succession is excellent to do anytime you are standing or waiting in line. 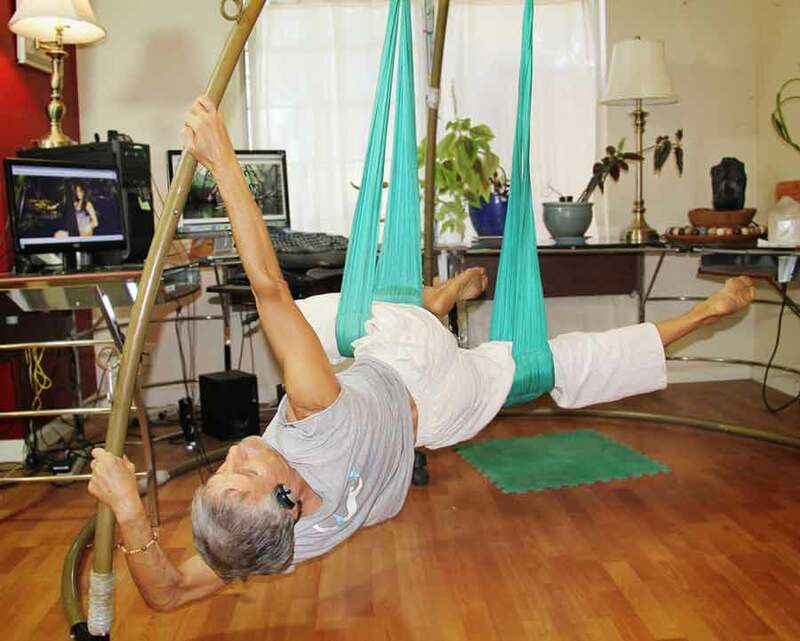 If you’re lucky enough to work from home, you might consider setting up your Omni Gym Yoga Swing as a (passion)work station. The goal is to relieve excess tension and prevent the usual amount of tension from building up. Incorporate these micro movements on a daily basis and when you get home at the end of an eight hour day you won’t feel as tired as you normally might, you might even feel refreshed. PreviousPrevious post:Inversions: What Type is Best for you?